Education online resources are an excellent way for anyone to stay busy and mentally alert. It's not true that you are too old to learn something new or fulfill a life long dream. There are free educational websites and free educational games. Free online learning is available for a wide variety of subjects and interests. Susan Furst is using her mobile phone to record ideas for her next book. A growing number of older adults and teachers are taking advantage of education online resources found on the Web and accessing this information using mobile phone technology. Internet and mobile phone technology should be designed to empower everyone interested in using it. Embracing technology and online learning platforms should be for everyone. New technologies and Web services should be intuitive and easy to use. Taking advantage of the many online learning resources out there to learn how to use new technology is a great investment of time. Teachers can use Web-based resources that are also accessible using a mobile phone to supplement traditional textbooks. Student engagement will increase when students are exposed to authentic content. Collaborative activities found on online learning platforms will inspire critical thinking and creativity for student learners. When selecting teacher resources websites, teachers should look through free websites to select the best website to use for classroom instruction. “Official” websites are the best resources. Top online learning sites include The Nobel Foundation, sites ending in .org, the Goethe Institute, U.S. Department of Education, reputable online newspapers, National Geographic, PBS Teachers and BBC. Teachers should select websites with information related to the instructional curriculum. Find content related to the learning objectives for the topics currently taught in school. Use a social bookmarking system such as Delicious to create a collection of websites for future use. Google Alerts are a great way to receive notifications about the topics and keywords related to the curriculum found on free educational websites. Before creating a lesson plan, review the content of the chosen website. Is the website accurate, up-to-date and appropriate? What credentials does the author have? If there is advertising, what do the images say about the site owner? In the lesson plan, list learning objectives, design a Web-based handout and design a set of collaborative tasks. The tasks should require student creativity and interaction. Students should also be given tasks that will allow them to develop their critical thinking skills. There are more ideas that are found using educational websites for teachers lesson plans. Other things to include in the lesson plan are designing a final product and an assessment plan. Don’t forget to reserve space for notes about the education online resources. Check that the online learning sites for students load properly on the school computers. Have a backup plan in case the Internet connection goes down. Susan Furst is autographing copies of her first published book at her book signing party. Establish rules before implementing the learning online activity. Establish clear expectations that prohibit student mobile phone use of social media channels, emails, texting or games. Brainstorm the etiquette for working in groups. No more than three students should share one device. Monitor student progress and time. Make sure students maintain their focus and give feedback when needed. Help students taking notes on a Google Document by using the Insert Comment feature to offer pointers. Ensure that students complete a final project that showcases what they have learned from this assignment. After the class is over, take a few moments to think about the assignment. Could students have completed the assignment without using free online learning? Did the activity motivate the students to learn more and keep them engaged throughout the entire class period? Take note of what could be changed or different the next time this activity is offered during instructional time. Traditionally, older adults have been slow to embrace technology. The main reason is that older adults are reluctant to go online because many technologies and networks are not designed to meet their needs and expectations. Lack of interest is not the issue because they do need to connect with friends and family online. They also have a desire to share experiences with strangers and new friends and explore education online resources. There are many online tutorial sites and online learning platforms out there. There are large numbers of older adults embracing the use of mobile phones. Mobile usage is growing. According to a recent study, around 13 percent of people in the 55 to 64 age range and 5 percent of people 65 and older play games using a smartphone or standard cellphone. The latest trends are showing the fastest growing demographics online. Social media network use among Internet users 50 years old and older has nearly doubled to 42 percent over the past year. In the United States, there are nearly 16 million people 55 and older using Facebook. “If it's good technology, seniors embrace it the same as everyone else,” Elie Gindi explains, following the senior-focused tech blog ElderGadget. “The key here is if it's really good and they see a real use for it, whether for entertainment, business or lifestyle. They are smart shoppers who are so interested in the useless bells and whistles many products contain. The planning process for new projects should include the concept of accessibility from the very beginning. Design, text size and physical usability should also be included as part of the planning process. Older adults and teachers should embrace how to use the new technological products and services when they appear in the marketplace for purchase. Harry Beja, my father, stayed active and worked part-time after retiring from full time employment. He developed many interests including taking movies with a camcorder, learning more about Christianity, traveling and having fun. He used computers and education online resources to stay current of current events. 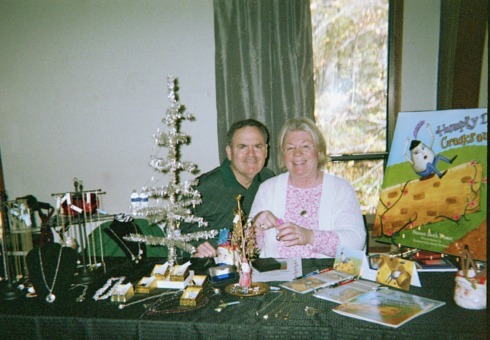 Susan Furst and her husband at a craft show selling her hand made jewelry and her new book Humpty Dumpty Cracks and All. Susan Furst sells the jewelry she makes in her own Etsy store. She has wriitten and published a book entitled Humpty Dumpty Cracks and All. The book is available for sale at this website and on Amazon.com . Her daughter has some training in Graphics Design and has done all the illustrations for the book. She is a retired special education teaching assistant. Susan has been working hard to turn her hobbies into making extra spending money. She sells her hand made jewelry at craft shows and has book signings to generate interest in purchasing her book. She uses a mobile phone to access education online resources that help her to save time hobbies into cash. 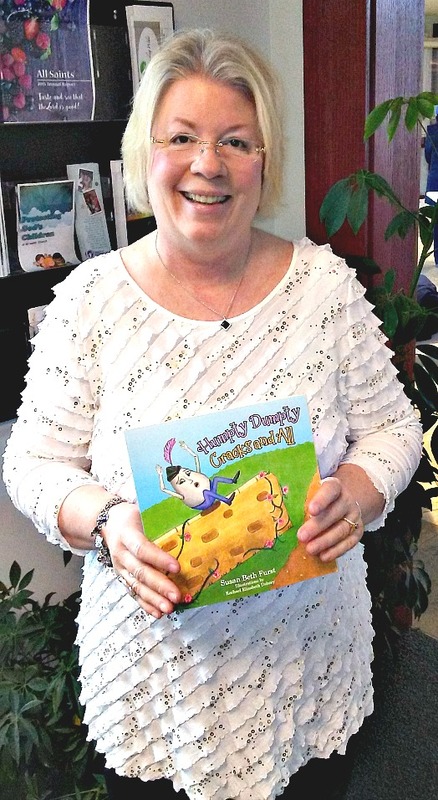 Author Susan Furst holding her new book Humpty Dumpty Cracks and All.